The restored Treasury of the Athenians at Delphi. 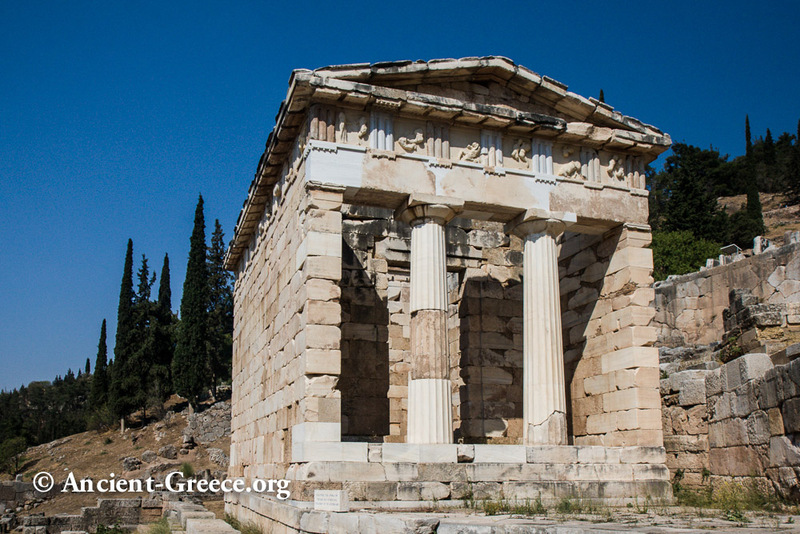 The Athenian Treasury was a votive building in the form of a reduced scale temple, designed to hold the multitude of Athenian offerings to the Delphi oracle. 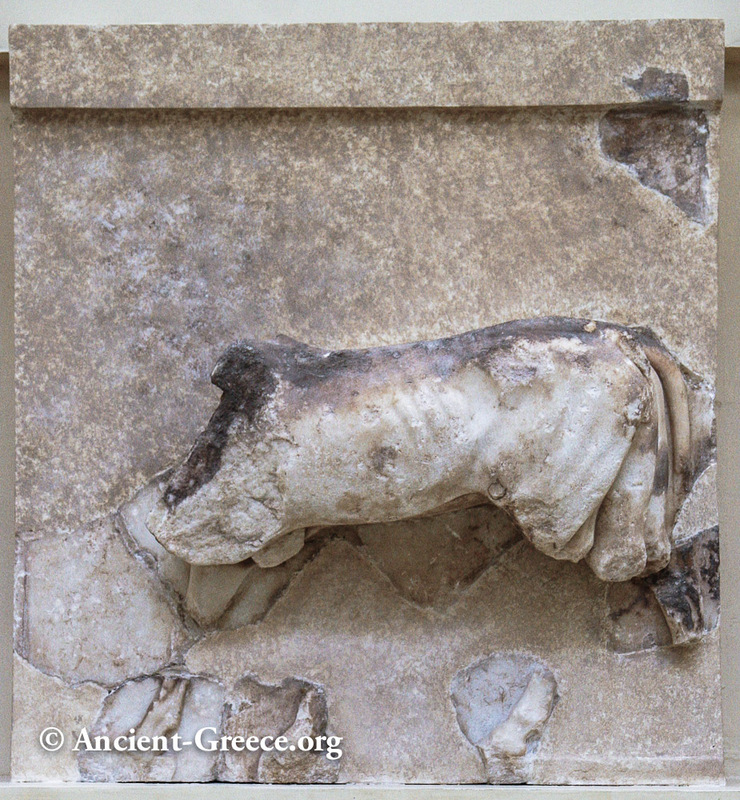 The building was constructed entirely of Parian marble and had a Doric frieze decorated with 30 metopes. It is a distyle in antis building with a porch before the entrance to the cella, measuring 10 x 6 meters. 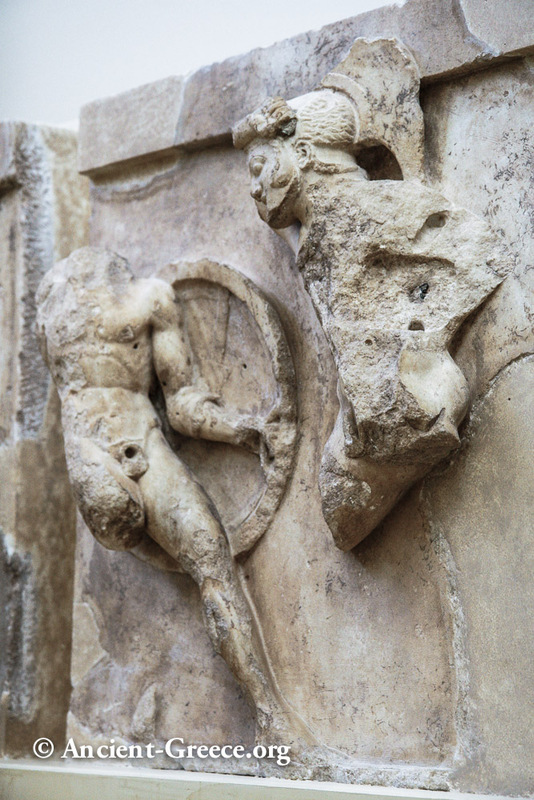 The metopes depicted mythological themes of Theseus, Heracles, and Amazons in high relief. 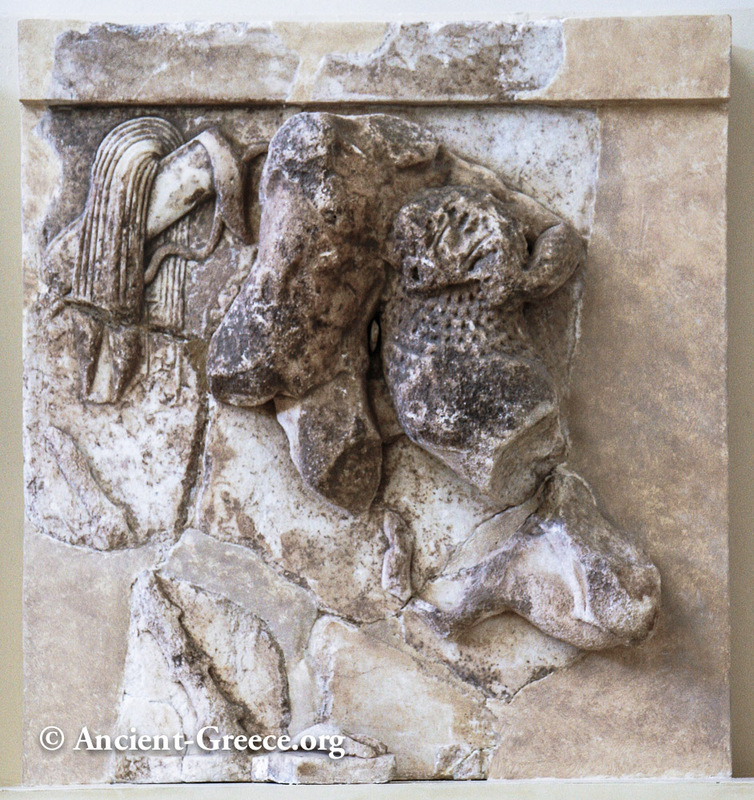 It is believed that two Athenian sculptors carved the metopes, each representing a distinct style or generation: one from the Archaic period, and one from the Severe style of classical art (the transition from Archaic to High Classical art). The walls of the treasury were inscribed with various texts, among which are the hymns to Apollo which included melody notation (see below). Several dates for it's construction have been suggested (with Pausanias mentioning that it was built after the battle of Marathon), but it is widely accepted that its was created sometime between 510 and 480 BCE, a period framed by the founding of the Athenian democracy and the defining battle of Marathon. It remained intact to modern times mainly because it remained in use as a house of pawnbrokers (their names are inscribed on the walls to mark each pawnbroker's place). To the left of the treasury, in a highly visible triangular area the Athenians displayed the actual spoils from the battle of Marathon. A large inscription at its front described what the visitors were witnessing: "The Athenians to Apollo from the spoils of the Persians at the Battle of Marathon." The treasury of the Athenians ( left), with Stoa of the Athenians (columns on the right). 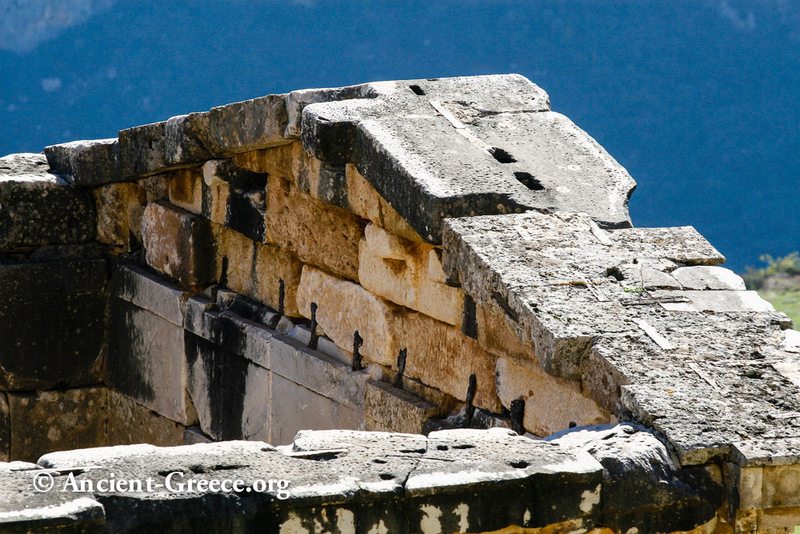 The building was reconstructed between1903 and 1906 at the expense of modern Athens. 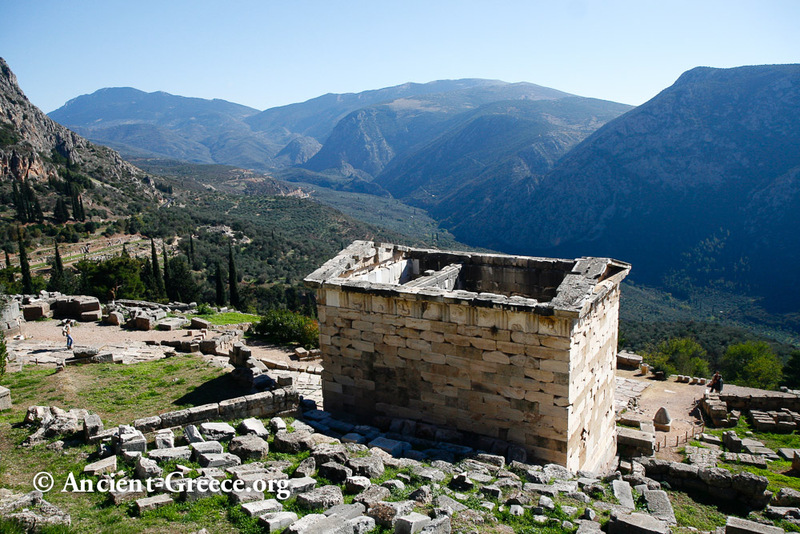 It is the only building at the archaeological site of Delphi that stands in its true dimensions. 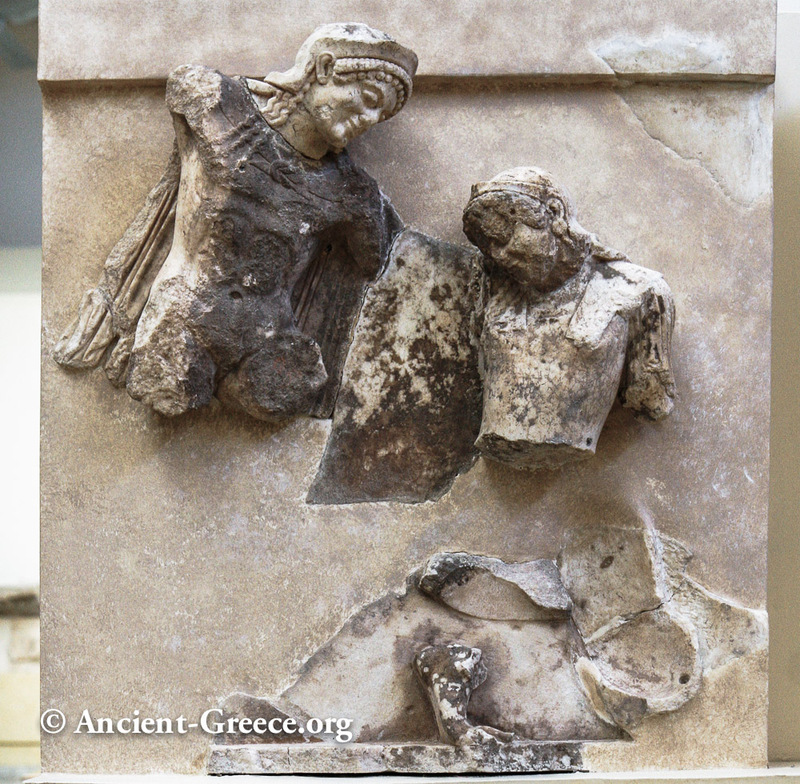 Treasury of the Athenians metope: Theseus and Antiope. Early 5th c. BCE. 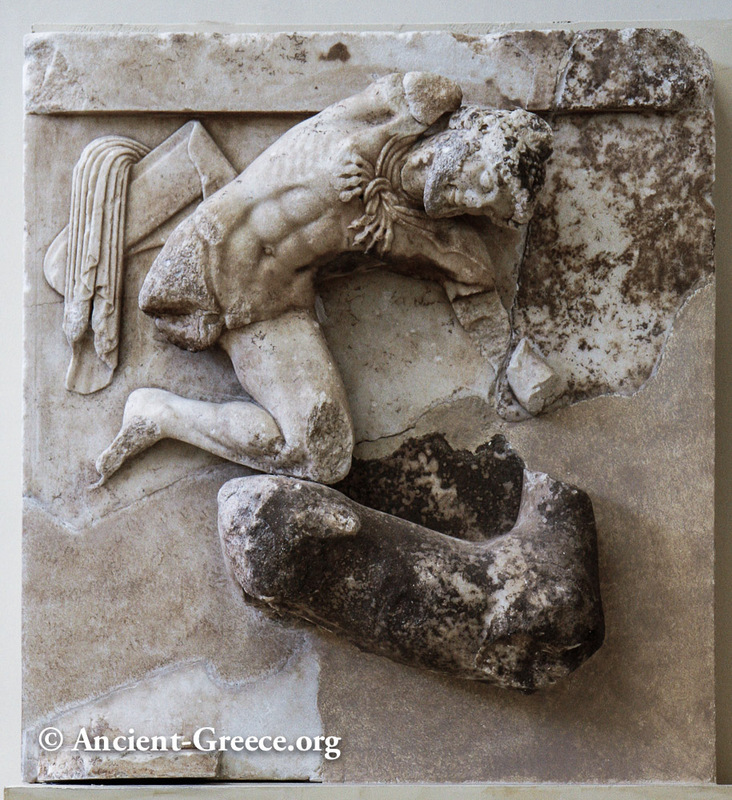 Also see: Theseus and Antiope sculpture from the temple of Apollo at Eretria. 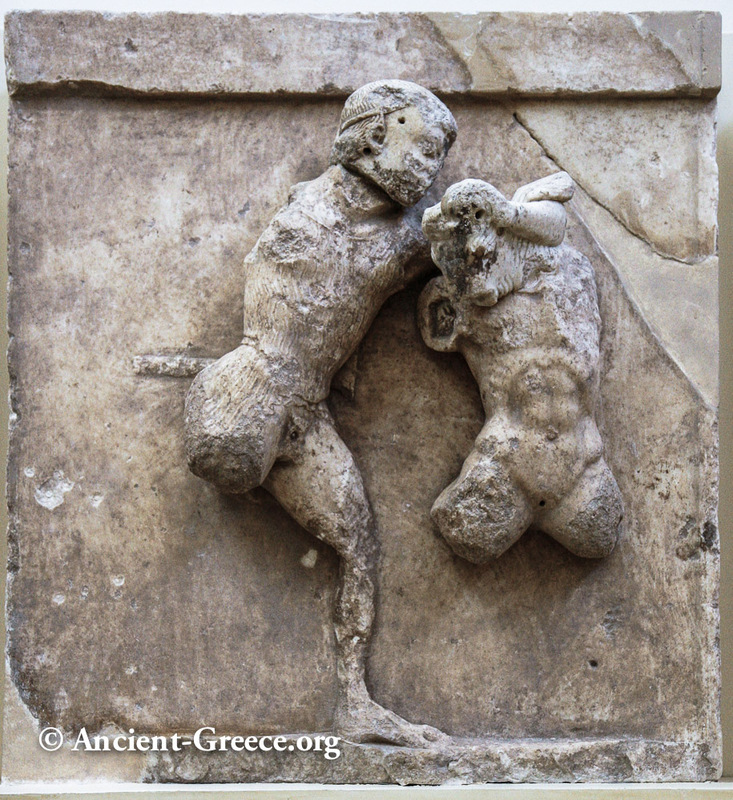 Theseus and the Marathonian bull. 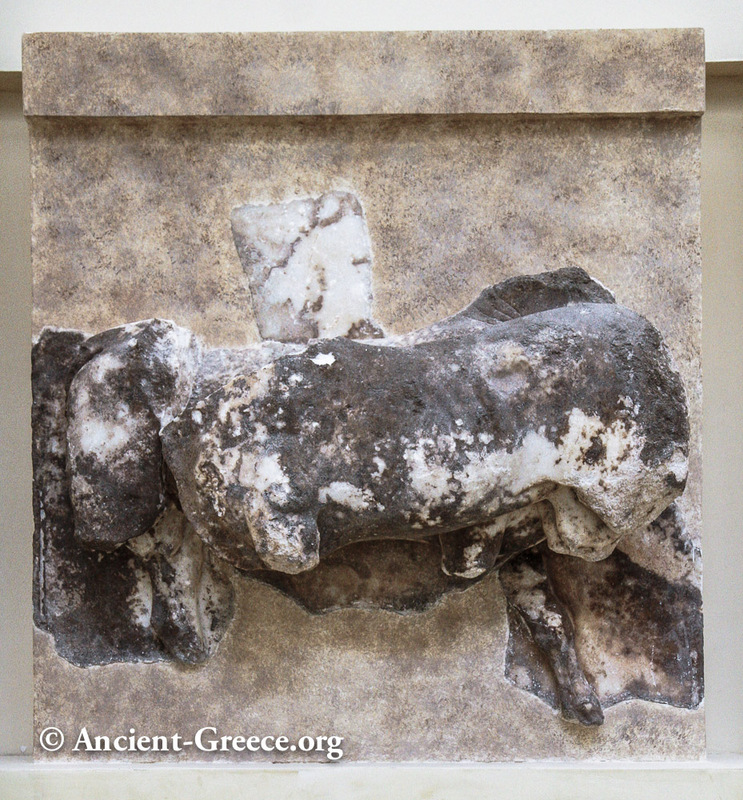 Heracles and the cattle of Geryon. 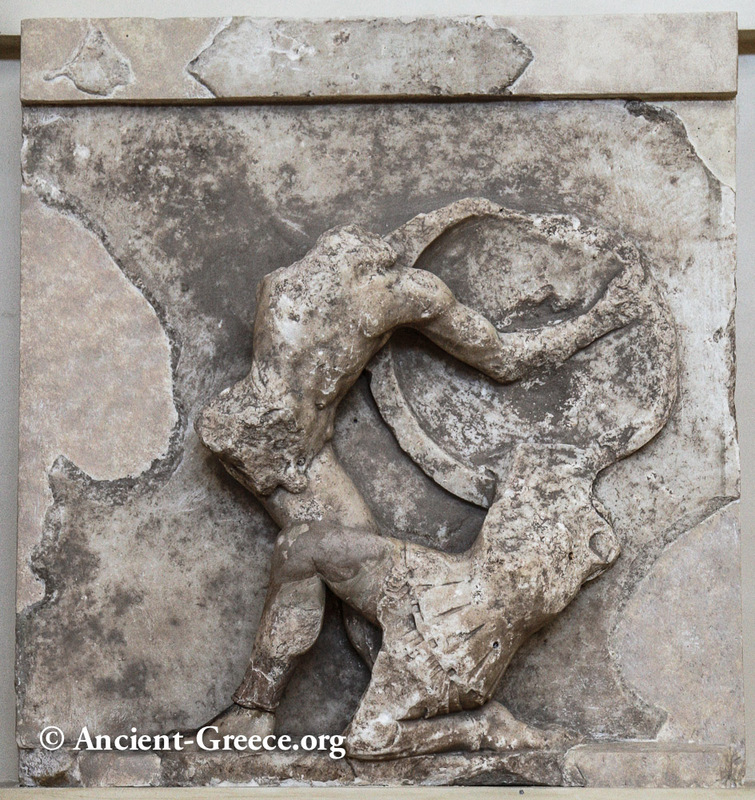 Herakles battles the three-bodied giant Geryon. 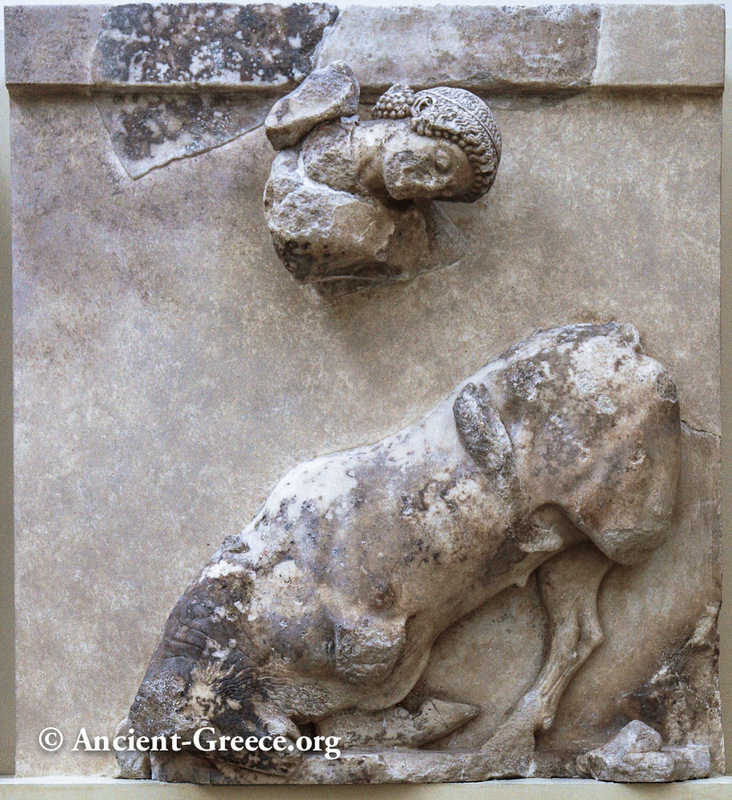 Heracles and the Ceryneian hind. 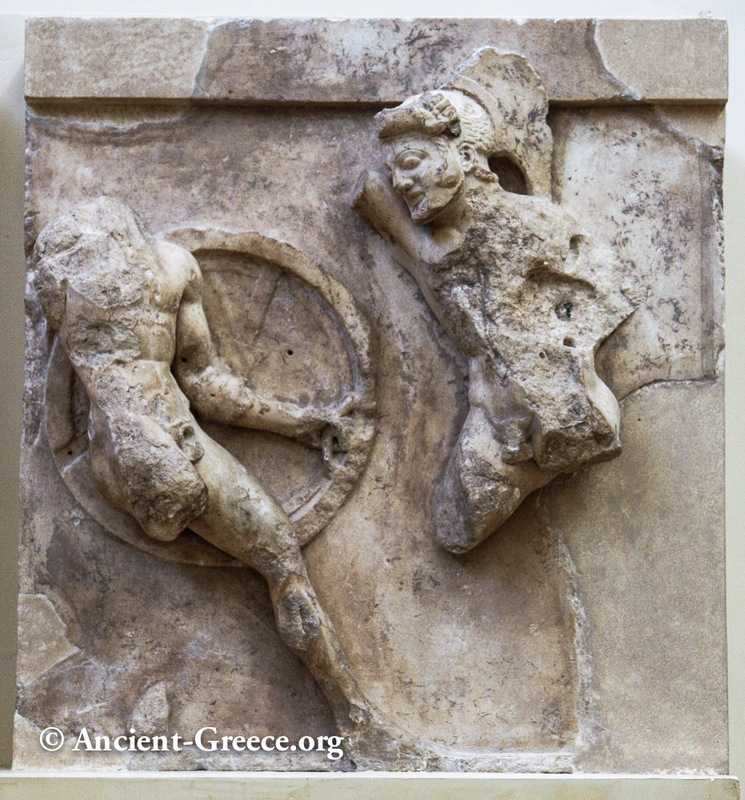 One of the acroteria which decorated the corners of the Athenian treasury roof. 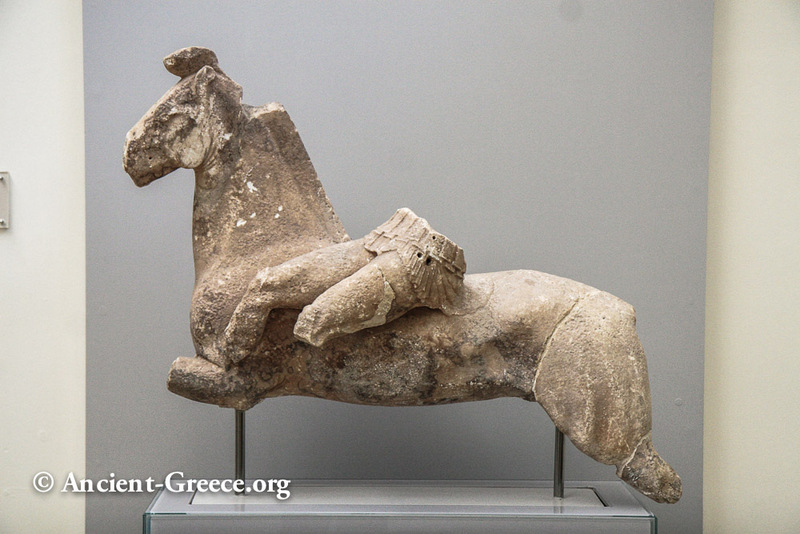 It depicts an Amazon riding a horse. 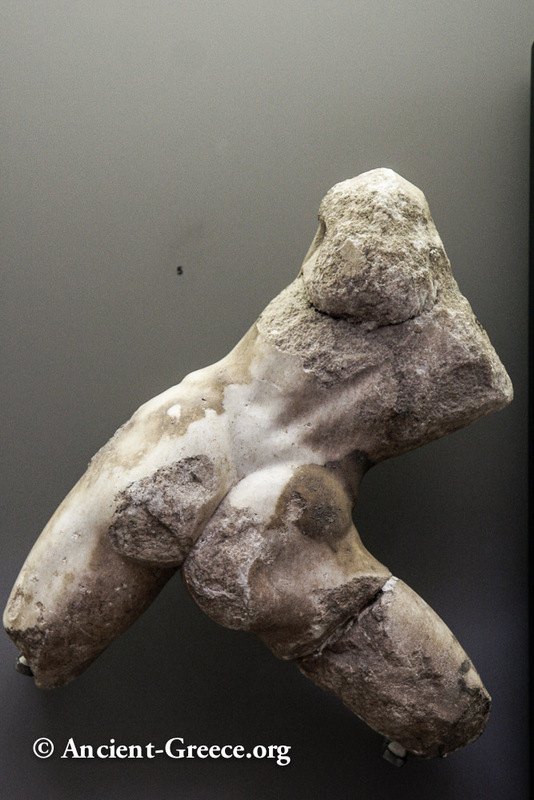 Marble statuette of a male, perhaps Heracles from the fight with the Centaur. 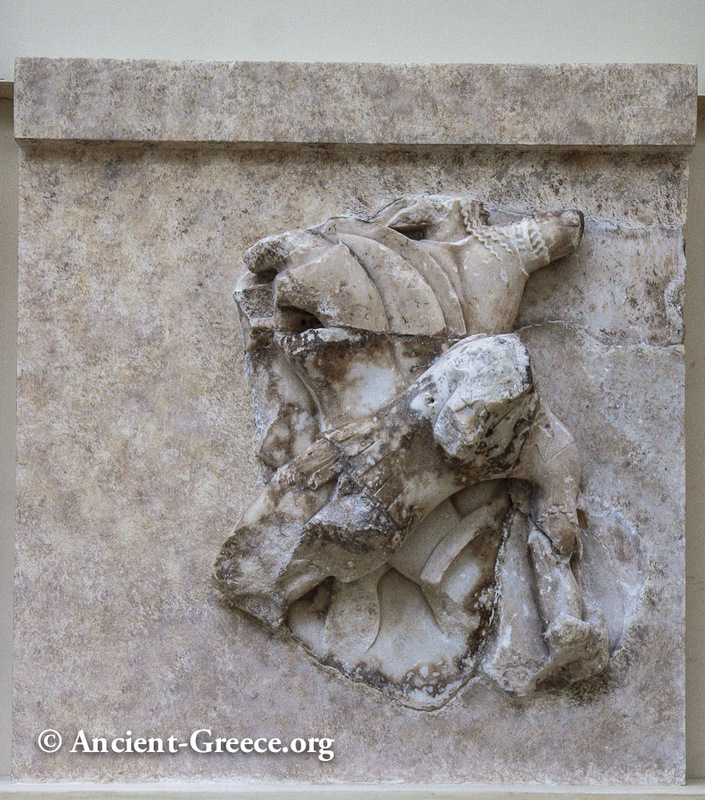 Female head believed to depict Athena from a statue of either the west or the east pediment. 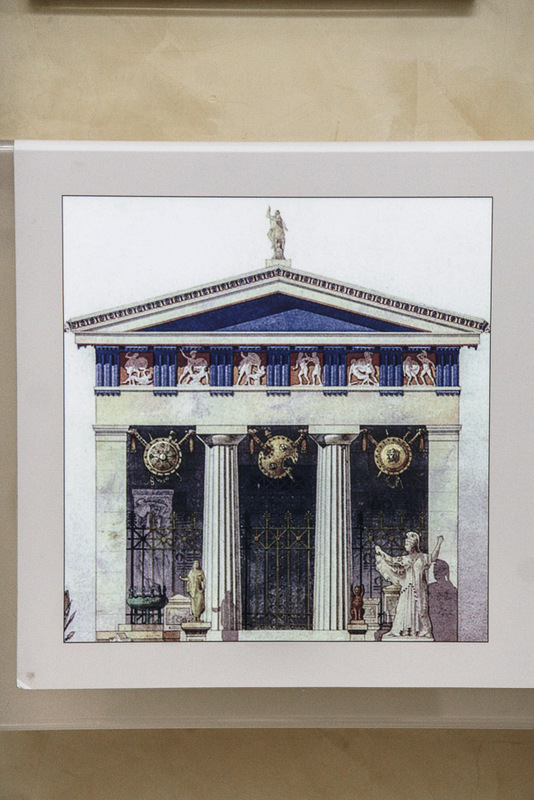 Reconstruction of the Athenian Treasury as it appears in the Delphi museum. 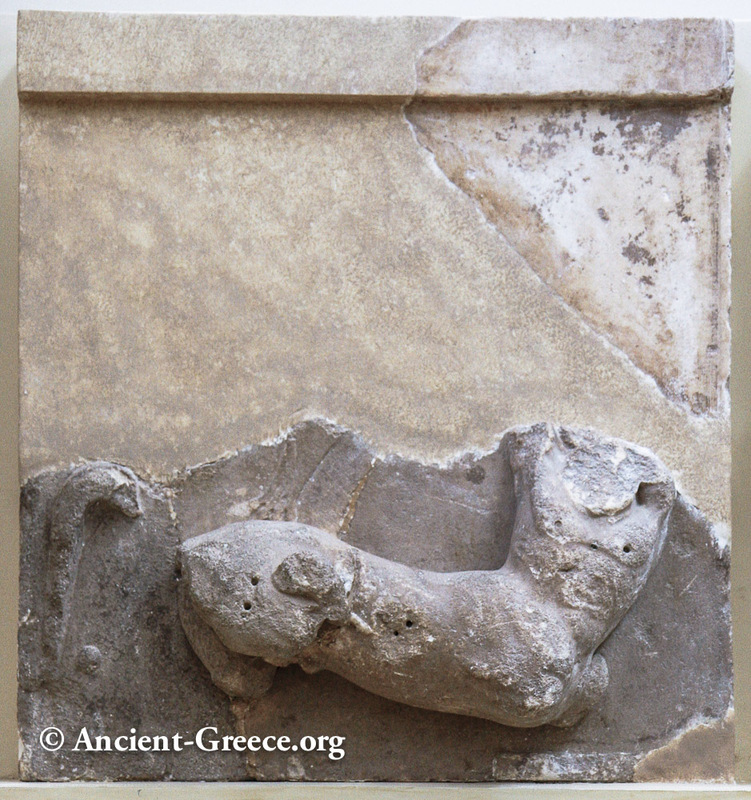 Detail from one of several marble slabs from the Athenian treasury with carved musical inscriptions - hymns to Apollo. These are the oldest written notation of a melody. 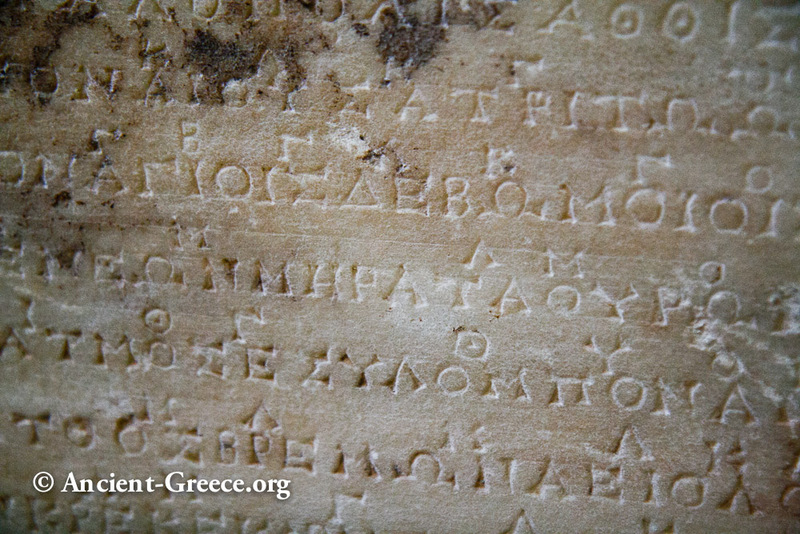 The verses are written in the Ionic alphabet with notes inscribed for the choral and instrumental scores. The music for the instruments (cithara, lyre, flute) was written in combinations of characters and punctuation. 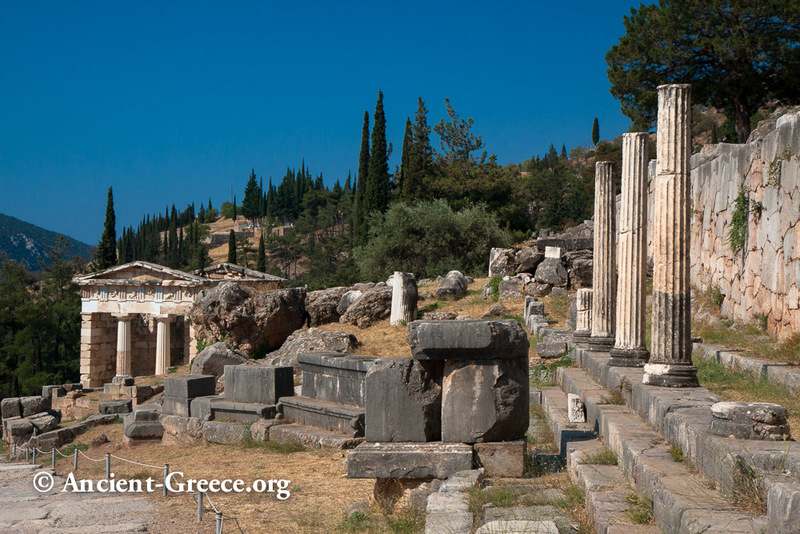 The hymns were composed by Athenaios and Limenios to accompany sacrifices and ceremonies in honor of Apollo during the procession of the Pythais (Athenian officials and pilgrims). They were sung by a large choir accompanied by lyres and flutes. 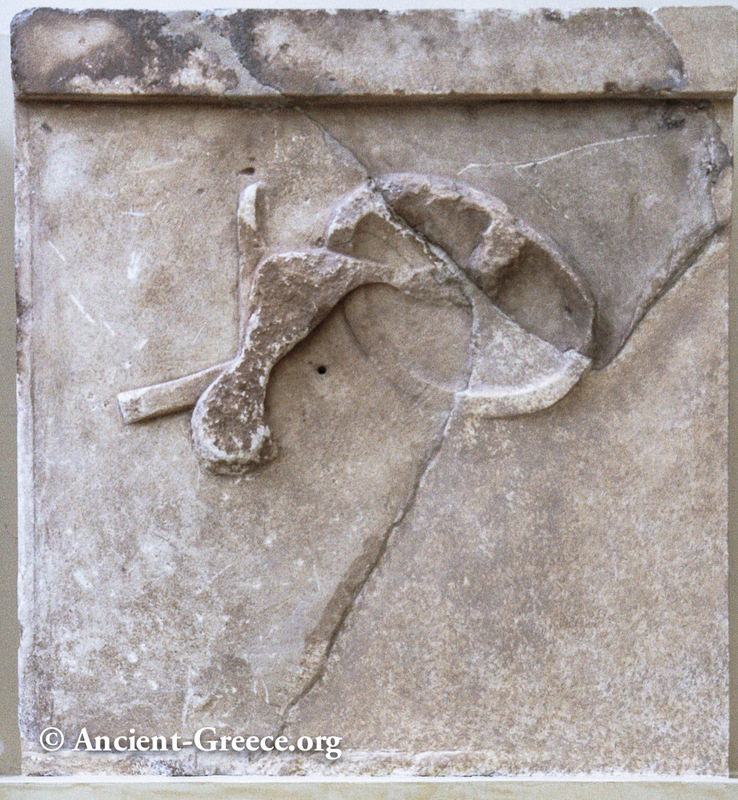 Inscribed on the treasury's wall in 128 BCE.